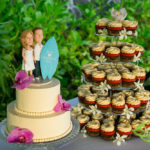 The Daylight Mind located on Alii Drive in the heart of downtown Kona Hawaii is a great location for both a wedding and your wedding reception. 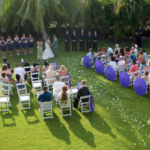 Weddings can be located on the lower area such as this wedding or on the back porch (or lanai in Hawaiian). The staff is great and the food is wonderful. 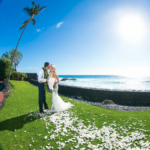 There are palm trees, rock walls, a beautiful lava rock reef and even some sand just outside the venue for great photos with your family, bridal party and wedding couple. The evening started out cloudy and it looked like at first that there was not going to be any sunset at all, but then the sun peaked out as a beautiful red ball and the couple was happy. After about 10 minutes past sunset the sky started to glow and then the color got richer and richer and the couple was thrilled. 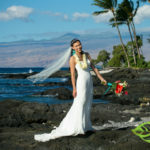 We were able to capture that last amazing shot by using a separate flash located about 20 feet from the camera, allowing the couple to be lit without the rest of the foreground also being lit.